Oil Colour has the most history of all artists’ paints, its first recorded use dating back to 650AD. It offers the advantage of a long working time as it takes a good while to dry (six months being a rough guide). It’s therefore suited to working over a period of time and several painting sessions. When using Oil Colour, you’ll need solvents such as Turpentine or White Spirit for diluting (or thinning) and for cleaning materials such as brushes. It’s usually applied to stretched and primed Cotton Canvas or Linen. In additional to conventional Oil colour there are a few variations that can be used to achieve similar effects and can be used in the same way as with Oil, but provide further versatility to artists who may have alternate requirements when using this historic medium. Winsor & Newton Artisan Watermixable Oil is a genuine oil colour which avoids conventional solvents. This oil can be mixed with and cleans up with water. With no odour this range is ideal for those with shared studios, working at home, or with health concerns or allergies. This range is made from both pure and imitation pigments. Winsor & Newton Griffin Alkyd Oil is a fast-drying oil colour can be used in quicker methods of working or by those with no time to lose. This range is also made from both pure and imitation pigments. 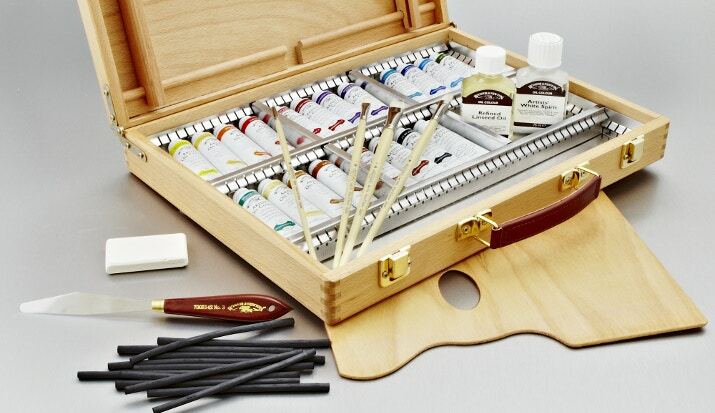 Winsor & Newton Oil bars are conventional Artists Oil colour, only produced in the form of a stick, convenient and easy to use with no brushes or palette needed. Can be mix with any other Oil colour or used in the same way with solvents. Oil Mediums are used to enhance the working characteristics, application methods, effects and results in using Oil colour and there are various types available to suit all working needs and practices. Beneath the broad term of Oil Mediums, there are three main types: Solvents, Drying Oils and Oil Mediums and within each type there various further variations of different product types. Oil Colour Solvents are used to thin or dilute the Oil colour from the tube or to intermix and thin other Oils and Mediums. Oil solvents are also required for use in cleaning brushes after use as well as other working materials such as palette knives or palettes. There are a variety of Solvents available, with their suitability often dependent upon the artist’s preference and the main solvents available include Artists White Spirit, Distilled Turpentine, Sansodor / Low Odour Solvent or Zest It. Distilled Turpentine is the most renowned oil thinner and cleaner used for thinning oil paint to create more watery colour or mixing with dryers to create thinner painting mediums although has a strong odour and can be an be an irritant when in contact with skin. Low Odour White Spirit/ Sansodor is for use in the same way as White Spirit and Distilled Turpentine, only without the odour, the consistency, viscosity and quality may vary slightly between brand and/ or manufacturer. Zest-It offers an alternate unique range of Hazard free Oil colour thinners which can be used in the same manner as all of the prior Solvents, but without the odour as well as the health risks. Oil Colour Drying Oil Mediums encompass a wide range of products that can be used for improving the flow of paint and reducing brush marks whilst increasing the gloss and the drying time (open time) of oil paint. They each hold individual characteristics that separate them from one another, information on a few of the most popular can be found below. Cold Pressed Linseed Oil is a slightly yellowy oil, which is extracted without the use of heat. This can be added to colour to reduce the consistency, improve flow and increase gloss and transparency whilst reducing brush marks. It can be thinned with Turpentine or White Spirit and dries slightly quicker than refined linseed oil and may have better flow with some colours. Refined Linseed Oil is the purest and often most popular oil offering many of the same qualities as Cold Pressed Linseed Oil, but is slower drying. It is a pale coloured alkali-refined oil which reduces oil colour consistency and increases gloss and transparency. Bleached Linseed Oil is a refined pale oil of slightly increased viscosity, which will improve the flow of colours and dries slightly faster than Refined Linseed Oil. This oil is thinner and paler than thickened linseed oil and is useful for use with white and pale colours. It dries slightly slower than Thickened Linseed Oil. Linseed Stand Oil is a pale highly viscous syrupy oil that can be mixed with Turpentine or White Spirit to improve the flow and levelling of oil colour. Retards drying but imparts a tough, elastic finish. It can also be used in conjunction with Turpentine or Artists’ White Spirit to improve colour flow. It is well suited for glazing and for fine detail and is resistant to yellowing while increasing the durability of the film. It slows drying and is the best oil to choose as an additive medium. Poppy Oil is drying oil used to increase the drying rate. Made from poppy seeds, it is the palest of the oils and is resistant to yellowing which makes it well suited for whites and pale colours. Oil Colour Mediums are products for use with Oil colour, which are not defined or considered either Solvents or Oils as they are often produced from two or more pure Oil or Solvent solutions. Artists Painting Medium for example is a pre-mixed combination of Turpentine and Linseed Oil, convenient and ready to use straight from the bottle and this product improves flow, transparency, gloss and increases the working time of the oil colour mixture. This medium is perfect for those first starting out in oil painting or who are unsure what ratios of solvent and oil to mix for optimum results. Liquin Original is the most popular of the Liquin family from Winsor & Newton and is a general purpose semi-gloss medium which improves flow and transparency, smoothing brushwork. The key ingredient in all Liquin products is known as Alkyd and shares a likeness with other Alkyd mediums available from other brands. Liquin Fine Detail is a more fluid alternative, which is gloss for more detailed work producing even smoother brushwork. Liquin Light Gel gives a non drip effect ideal for glazing, is high gloss but without the drip. Siccative is actually a solvent, but in the broader sense as a medium it is unique in that it is best used as an additive to speed up the drying of oil colour. It can be must diluted in small drops with either turpentine or white spirit as it is far more concentrated when compared to Alkyd mediums with the active ingredient being Cobalt driers. It is advised that it is not used or mixed sparingly directly with oil due to its potency.